Nike, proud partner of the United States Olympic Committee, yesterday unveiled a speed system for its track and field athletes. These Innovations will help US athletes who are going to participate at Olympic Games in Rio de Janeiro in August this year. Nike’s new symbiotic track and field speed system which is customizable to the event and athlete; is expressly engineered to reduce that drag and maximize effort. Nike’s track spikes and Nike Vapor track and field kits, which minimize weight via Nike AeroSwift technology featuring recycled polyester. It’s an adhesive tape with silicon-based spikes that runners will wear on various parts of their bodies at different distance based on what part of the body they are placed. AeroBlades prototypes were created using 3D printing technology and tested hundreds of different shapes in a wind tunnel. It’s used to reduce the wind resistance or aerodynamic drag during competition. "We were tasked to combat the enemy of fast and deliver on the athlete's desire to look fast, feel fast and be fast," said Martin Lotti, Nike's vice president and creative director for categories and concepts, reports ESPN. Weigh 4 grams less than traditional eyewear - these sunglasses will act a performance enhancer and increase efficiency. The design is such that it uses single piece of glass without hinges. It allows only red light through that gives a calming effect to the athletes. It can directly stick onto the uniform and have a unique quality of withstanding extreme heat and rain. 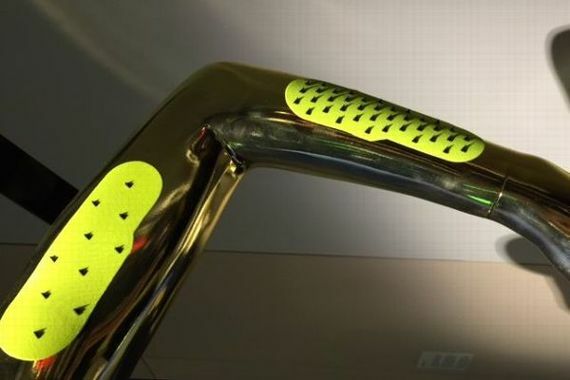 All three innovations were approved by the International Olympic Committee, reports ESPN.